Memphis lost to a team that has always been more aggressive about developing young talent. Of all the things coaches hate, globally televised boneheaded mistakes surely top the list. Not even the most veteran are immune. Derek Fisher inbounded a crunch-time ball to the other team in these playoffs. Manu Ginobili shot an early-clock covered long 3-pointer that almost cost the San Antonio Spurs a game. But, by and large, the spectacularly mindless moments, the ones that get Shaquille O'Neal mocking you in custom video from an Atlanta studio, are the province of the young. That's why so many teams keep young players stapled to the bench in big moments. But there's an oddity: Those very same McGees tend to have valuable things like superactivity and bodies from basketball heaven. In the final analysis, who's better for your team: an active and mistake-prone dude, or a fundamentally but athletically compromised guy? The old guys keep everyone from looking stupid. But sophisticated numbers suggest that even with all their missed rotations and biting-on-fakes, the youngsters like McGee are very often better at, you know, winning. Valanciunas, like most rookies, misses rotations, overhelps, and commits other sins of positioning on defense. Coaches hate that stuff, and they've often nailed Valanciunas to the bench in crunch time in favor of Aaron Gray -- a fundamentally sound player who lacks NBA athleticism. The numbers in large part disagree with that tactic, at least as it relates to Valanciunas's defense. The Raptors' defense has been better with Valanciunas on the floor. More importantly, the visualization data shows that Valanciunas is active and athletic enough to make up for all his defensive mistakes, Rucker and his team say. "With Jonas -- yeah, he's making mistakes," Boyarsky says. "But who cares?" Casey said he hasn't had deep discussions with the analytics team about Valanciunas, but Sterner has, and he agreed it's sometimes a thorny issue of valuing culture over results. "You want your defense to be sound," Sterner says. "Even though the production might be better, you still want [Valanciunas] doing the right thing. Coaches are playing "correct" Grays over "still learning" Valanciunases all over the league. It satisfies a coach's sense of order and control. Every coach wants his team to play the right way -- which is not so different from following coach's orders. Without that, what's the point of having a coach? Meanwhile, the guy who plays the "wrong" way often helps his team more, thanks to the many advantages of youth. It's a dilemma that trips up many NBA head men. But not Gregg Popovich. The story is that the Spurs' front office keeps feeding Popovich NBA-ready role players, and by the time his team's in the Western Conference finals, he can confidently trot out Kawhi Leonard, Danny Green, Tiago Splitter, Gary Neal, Cory Joseph and the like, who are all both young enough to be in their athletic primes and schooled and experienced enough to do things the right way. Only it's not luck at all! Popovich gets the same unproven players every team gets -- in fact, he gets worse ones. The Spurs haven't had a lottery pick since Tim Duncan in 1997. Nevertheless, he plays young players relentlessly and aggressively all season long. He plays young unproven players when his team is ahead. He plays them when his team is behind. He plays them when his team is in first place and when they're in last. He plays them in all four quarters and in overtime. And, most importantly, he does it season after season. Splitter was once the Spurs' Valanciunas, if you will -- only the kind you draft 28th overall instead of fifth. Splitter has started 66 games for an elite team and has played close to 4,000 NBA minutes. Popovich has had plenty of time to make clear what he wants from his big man. 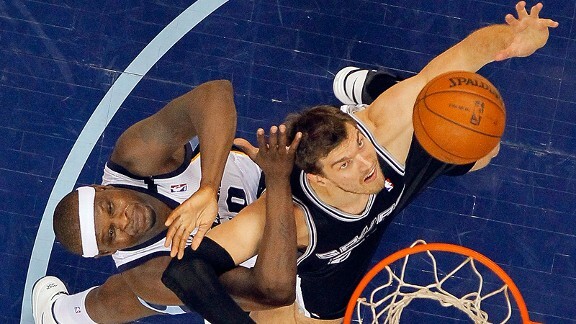 By crunch time of a conference finals elimination game, coach and player had built so much trust that Splitter was not just on the court, but was the linchpin of the Spurs' successful campaign to thwart the pound-it-into-Zach Randolph Memphis Grizzlies. Splitter was much bigger and gave Randolph fits. Randolph can't counter that. And his impulse was to take Splitter closer to the hoop, but that close Splitter's length becomes even more useful, and there was help almost every time. Zach just had a little tiny bit of space to operate. It was a huge factor in deciding the series." That's the kind of advantage Popovich develops for himself, and this is hardly a one-off. In 2001-02, the Spurs were a 58-win contender with an unconventional 19-year-old rookie French point guard who couldn't really shoot, didn't rack up a lot of assists, was undersized and didn't play great defense. Any coach would have benched Tony Parker while he was learning, and it's no secret why. I'm not sure I can recall a coach more openly exasperated with Parker than Popovich was that season. But you know what Popovich did? He played Parker more minutes that season than Parker played this season -- when he was an MVP candidate -- saying all along that he wanted to see if Parker could develop into the kind of player he knew he could become. If you believe Thorpe's talk of "royal jelly," Popovich's minutes and belief played starring roles in the development of all the Spurs' talented young players. In other words, it's likely Parker would not have turned out as fantastic now without all that learning on the job back then. This season, Green led the Spurs in minutes played. Splitter, Leonard and Neal all logged more minutes than Ginobili. It's about keeping the stars fresh, which is crucial. And it's about developing the young corps. The right way to distribute minutes is up and down the roster. When you get it right, you can end up with fresh veterans and trusted young players, both of whom can work wonders. Memphis coach Lionel Hollins, meanwhile, does things like most NBA coaches and has come to trust few of the Grizzlies youngsters. Darrell Arthur and Quincy Pondexter have developed into rotation players on the job. Ed Davis, Donte Greene, Austin Daye, Tony Wroten, Jon Leuer and Company, however, well, we'll never know if they could have helped against the Spurs. When they got to play together, the Grizzlies starters with Davis in place of Randolph comprised one of the most effective units in the NBA, by plus/minus. Davis is long and athletic and offers help defense and rim protection that Randolph does not. Although the Grizzlies weren't good in Davis' almost 11 minutes in the conference finals, to the naked eye, Davis is far better than Randolph at containing Parker in the pick-and-roll, which turned out to be a key Randolph shortcoming in the series. Davis also has a track record, born in Toronto, where he played regularly, of finishing around the rim at an even more efficient rate than Randolph. That doesn't make him a better player, but it does make it a shame Hollins couldn't deploy him confidently to mix things up as the series fell apart. Different looks were precisely what the Grizzlies needed. Hollins only had Davis for 36 games after he arrived via the Rudy Gay trade, however, and he only played him an average of about 15 minutes per game. When push came to shove, Hollins didn't know what to expect. Did you happen to catch Leuer in Game 3? It was like seeing an antelope wander onto a Hollywood movie set. Where did he come from? He plays for the Grizzlies, by the way. Or, more accurately, he has been on the Grizzlies roster since January. Does 96 minutes over 41 regular-season games -- or 11 minutes over 15 playoff games -- count as "playing?" That's a tad south of two minutes per contest, all told. The Grizzlies got him to shoot 3s -- something he didn't play long enough to do in these playoffs. Hollins just coached the Grizzlies to the best season in team history. His team was well prepared for every game and, in an important measure of any coaching staff, has played gritty defense every minute of every game for years. Nothing is broken in Memphis. But when it comes to the fine art of turning prospects into producers, Popovich's aggressive youth-friendly approach is the standard. Popovich has missed with some young players, but he has also hit the bull's-eye more than once, and it's made all the difference.